A beautifully fashioned bamboo serving tray holds two pounds of dried fruit with nuts and a gourmet cherry berry nut trail mix. A fabulous hostess or office gift, the bamboo tray can be reused again and again for serving cheese, charcuterie or snacks. Healthy and delicious snacking in a keepsake bamboo serving tray that doubles as a cutting board, topped with fresh and tasty dried fruit paired with wholesome nuts and gourmet trail mix. 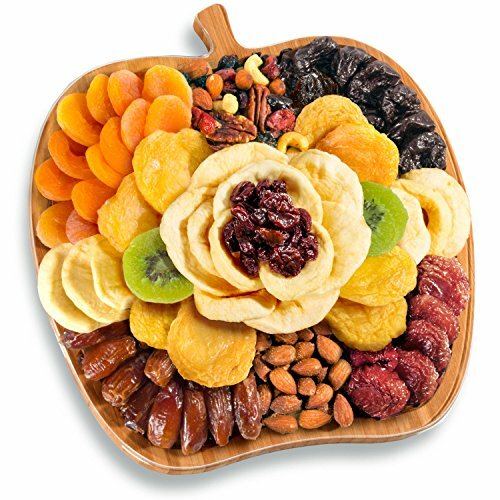 Dried fruits include pears, honey plots, apples, Turkish apricots, tart-sweet Montmorency cherries, prunes and kiwi for a low fat, high fiber treat. Fruit is paired with fresh roasted salted almonds and cherry berry nut trail mix. Ready to give or serve in a beautifully styled apple shaped bamboo serving tray cutting board to be used long after the treats are gone. Gift messaging available at checkout.